Looking for the latest data and insights on youth, student and educational travel? BETA with the support of our members are pleased deliver regular reports on the state of the market, industry trends and travellers motivations and behaviours. Published in September 2018. BETA is dedicated to benchmarking the industry and delivering relevant and updated statistics to enable stakeholders and influencers alike to benefit from a deeper understanding of the volume and value of the youth, student and educational travel sector to the UK. 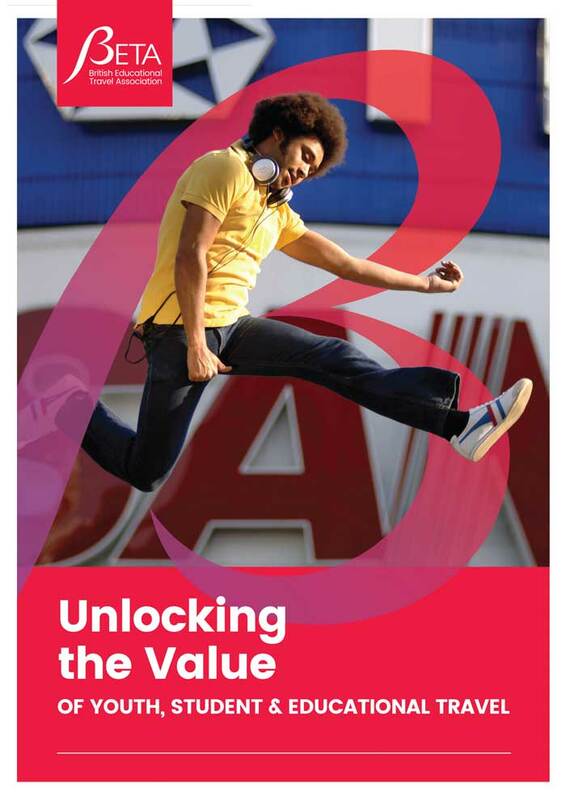 This report follows on from our comprehensive study entitled Unlocking the Value of Youth Travel which was published in 2017. For the first time we are able to look at the results y-o-y and compare growth within the sector. Whilst the report shows increase in the spend and number of arrivals, we are aware that its pace remains slower than that of our competitors. Published in June 2017. 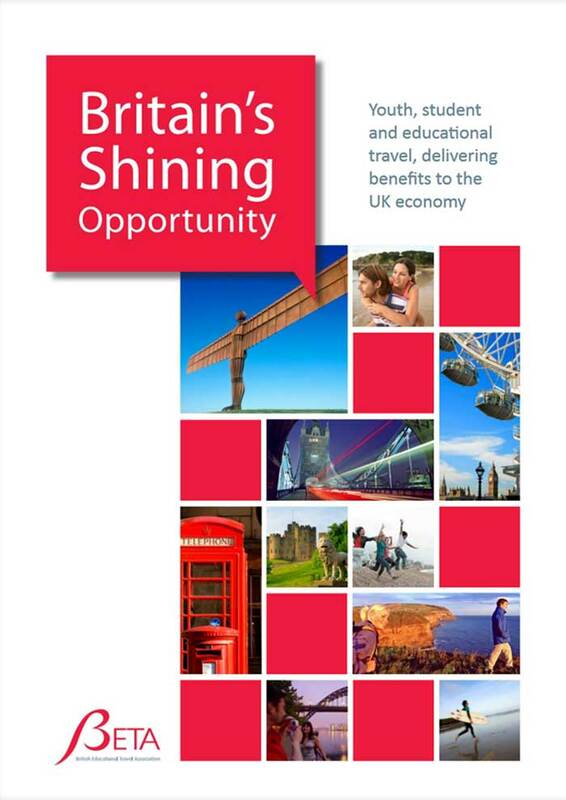 This publication provides a comprehensive analysis of the UK as a travel, education, and work experience destination for young people. 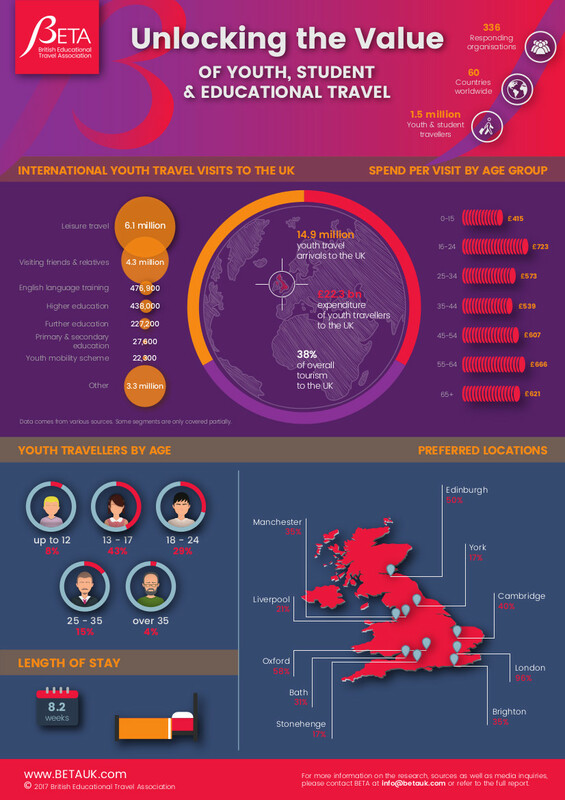 An extensive literature review took place, followed by worldwide research on both inbound UK providers and organisations internationally that regularly send youth travellers to the UK. The results draw conclusions from 336 businesses, which cumulatively represent more than 1.5 million youth travellers from 60 countries and shows that youth travellers to the UK represented 38% of all international arrivals in 2016 and that the market to date is worth £22.3 billion per annum to the UK economy. 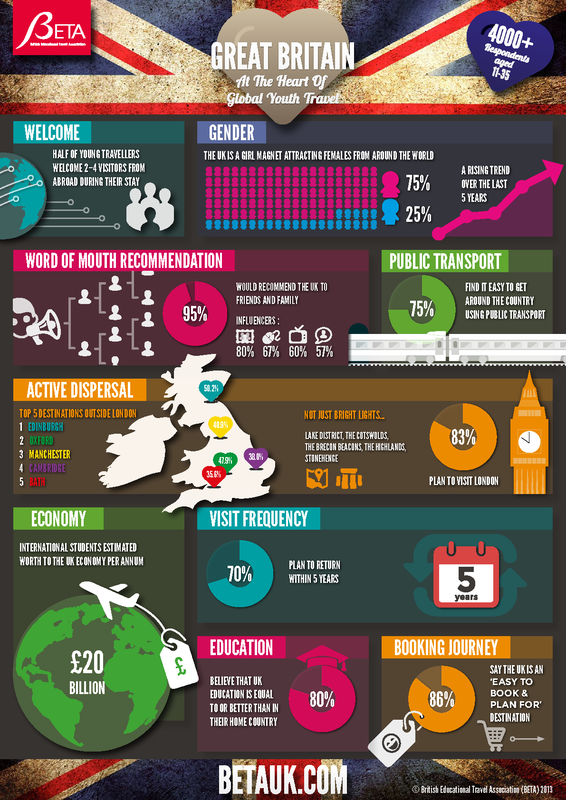 This project focusses on the consumer trends, behaviours and attitudes of over 4,000 youth travellers aged between 11-35 who chose the UK for study, work or leisure. It looks at their decision making, their influencers, the other destinations that the considered before choosing the UK. Our findings show that the UK is an aspirational and inspirational destination for young travellers. Their travel experiences strongly influence that they intend to return frequently, recommend highly and remain faithful to brand Great Britain. This project was an important first step in bringing together many resources that talk of youth travel into one concise document. 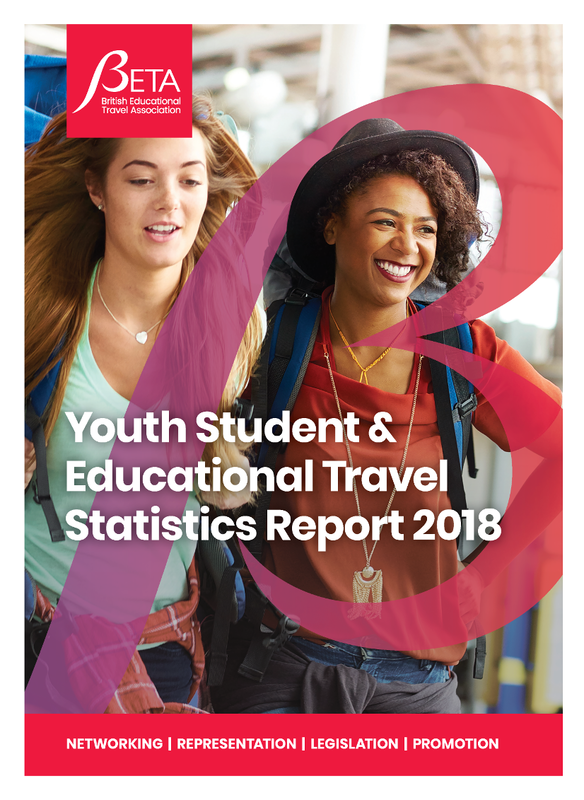 At the time of publication there lots of fragmented data sources covering various aspects of youth, student and educational travel making our task of profile raising and lobbying on behalf of the sector a challenging one. 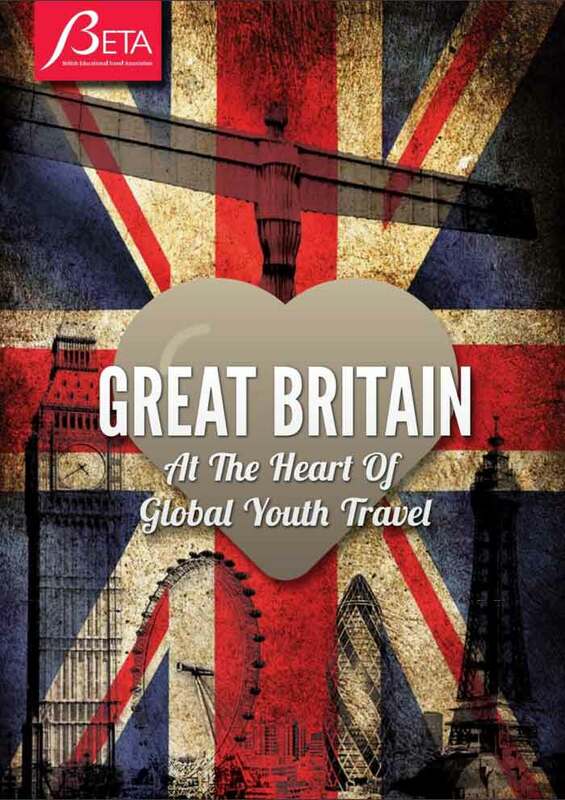 The team sought to bring these sources together in order to create a volume and value piece looking at the state of the UK youth, student and educational travel sector as a whole. This study draws together the relevant material to help destinations, government and other influencers to better understand the behaviours and attributes of this dynamic audience. Supported by a stakeholder survey, this document breaks down each segment from EFL to higher education and examines the changing source markets, forecasts growth and highlights that areas where the industry needs better support.